Testbells provides its customers the opportunity of analyzing the contents of its study guides before actual purchase. 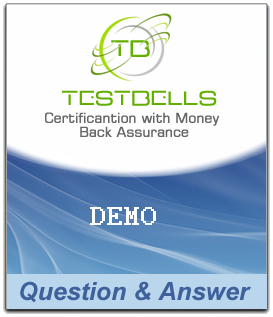 For the purpose, Free Demo of each product is available on Testbells's website. The demo will prove a compact summary of all the features of Testbells's study guides and will introduce you with everything in detail. It contains everything what we offer in a study guide in detail except the online help which you can use anytime you face a problem in understanding the contents of the study guide. The visitors can download the free demo and compare the study file contents with the material of the other study sources. If you want to see demo of any exam before purchasing it then feel free to contact us at support@testbells.com for sample of any exam. The brilliantly crafted set of questions and answers, study tips, practice tests and dumps will prove to be the best study plan for you. No part of the certification syllabus is left in the contents. All aspects of the exam have been explained with examples based on real-life scenario. That's why you never find Testbells's study guide deficient of anything. The free demo will also help you knowing the quality of the study material. It is up-to-date and excellent in quality. Testbells's professionals have prepared it consulting the best academic sources hence; it is far more superior to the preparatory help available online through other study sources. Testbells's study material will certainly impress you and will also be helpful in taking a solid decision in favour of our products. The uniqueness of the material will assure you of a definite success in just one go. It will definitely prove to be the best alternative of your time and money.